The founder of our institution, Eiji Hori, whose work this school has continued for eighty years, was born in October of 1886 in Uramonzen-cho, Naka-ku, Nagoya. He was the second son of Matsujiro Hori who operated a dye shop. After graduating from the Nagoya Public Commercial High School, he left in October of 1905 for the United States of America to study and remained there until January of 1913, studying many different subjects. After returning to Japan, he wanted to use the American style of vocational education to nurture students who would immediately contribute to society as actual workers. To realize this goal the Eishuji Accounting Academy was established in Minami Gofuku-cho, Naka-ku, Nagoya in June of 1913. The school was renamed Kyoei Business College (or K.B.C.) after 1915. This was the beginning of Kyoei Gakuen. Eiji Hori was a devout Buddhist who rose at 4 a.m. each day to clean the garden and gate area and say his prayers. Every year in May he would visit Zenkohji Temple and in 1926 he moved the temple his ancestors had built to a location in Amaike-cho. Being a man who maintained an interest in the folk religion of common people he built a main hall for the temple in 1930. Eiji Hori developed a new type of vocational education based on what he had learned in the United States and applied it to Kyoei Department Store which also provided on-the-job training and opportunities to study abroad. During World War Ⅱ Kyoei Gakuen was aerial bombed twice in 1945 and reduced to a burnt-out field. After the war, Eiji Hori carried on by holding his classes in empty factories that had once manufactured military goods. However, he suddenly took ill and passed away on April 9th, 1946. 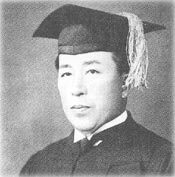 The traditions and responsibilities of rebuilding the school were then transferred to Yosifumi Hori, the present director.